Introducing Knapsack, the responsive, mobile friendly Joomla ecommerce template. Start your online fashion accessories store with the Joomla theme quickly. Knapsack is a responsive template with the Bootstrap 3 support to render beautiful store front across all devices iPad, iPhone and Desktop. It comes with 6 pre-built colour themes, mega menu and ThemeMagic for creating customised colour themes. 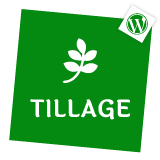 It is built on the robust T3 Framework to give you more flexibility in customizing the themes. No extra weight. No clumsy list of confusing layouts. It is straight forward, simple and elegant. Neatness and light-weight are the key features of Knapsack. We have added no unnecessary baggage to the template. It is built to the point. Enjoy the simplicity. The theme is a perfect fit if you are looking to build an online store for your small and medium fashion business. It is complete with product list views, detail views, cart and checkout pages. The best responsive Joomla template you look for. Be it your business small, medium, or big, Knapsack will be perfect Joomla responsive template. 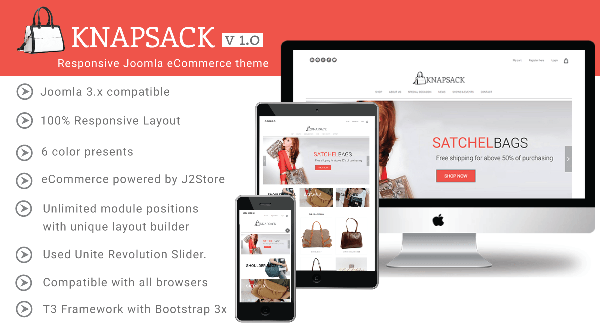 Knapsack Joomla template is integrated with the best Joomla Shopping Cart extension. J2store is a native Joomla shopping cart that makes your online shop operate so perfect. It is light-weight and uses joomla articles as products. If you are looking for a Bootstrap Joomla template, webshop template, or a template with best Joomla shopping cart extension, Knapsack is the best answer to all your needs. Knapsack is a package of latest technologies that includes a T3 framework, Bootstrap 3x, Joomla 3.4.x, J2Store Joomla Shopping cart, Multiple Layout Variations, Predefined colours and preset themes and much more. Quick Start package Set up your site in less than 5 minutes. Quickstart package is powered by Akeeba Next Generation Installation Engine. Its step-by-step wizard that guides you to install the demo smoothly.